A plane went down near Aleknagik with eight or more people aboard last night and it is believed that five did not survive the crash. 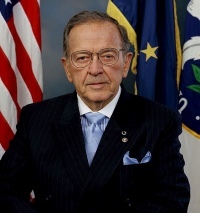 Former Senator Ted Stevens is thought to have been on the plane. This is not confirmed information. The De Haviland Otter is said to belong to GCI, and was on its way to a lodge GCI owns on Lake Aleknagik, north of Dillingham. A National Guard helicopter has landed at the scene. “The Alaska Air National Guard and U.S. Coast Guard are currently on-scene of a plane crash that occurred 17-miles north of Dillingham Monday night. An Alaska Air National Guard 210th Rescue Squadron, HH-60 Pave Hawk helicopter carrying 212th Rescue Squadron pararescuemen was able to land minutes ago and is currently providing medical support to the crash victims at the scene.